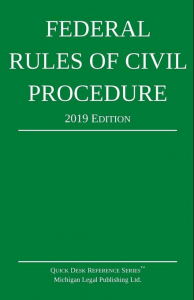 (2) Definition of “Officer.” The term “officer” in Rules 30, 31, and 32 includes a person appointed by the court under this rule or designated by the parties under Rule 29(a). (D) before a person commissioned by the court to administer any necessary oath and take testimony. (B) without a showing that taking the deposition in another manner is impracticable or inconvenient. (3) Form of a Request, Notice, or Commission. When a letter of request or any other device is used according to a treaty or convention, it must be captioned in the form prescribed by that treaty or convention. A letter of request may be addressed “To the Appropriate Authority in [name of country].” A deposition notice or a commission must designate by name or descriptive title the person before whom the deposition is to be taken. (4) Letter of Request—Admitting Evidence. Evidence obtained in response to a letter of request need not be excluded merely because it is not a verbatim transcript, because the testimony was not taken under oath, or because of any similar departure from the requirements for depositions taken within the United States. (c) Disqualification. A deposition must not be taken before a person who is any party’s relative, employee, or attorney; who is related to or employed by any party’s attorney; or who is financially interested in the action.